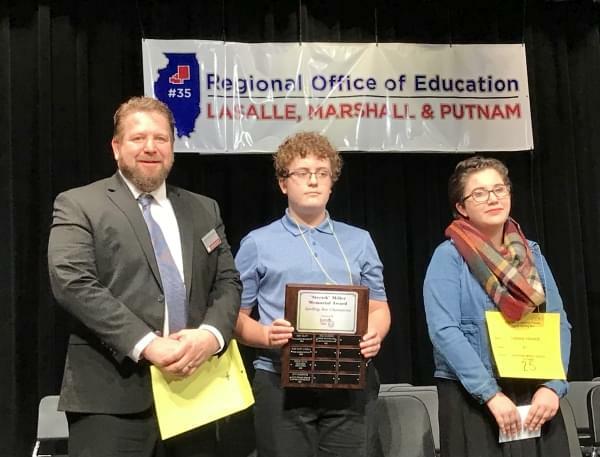 Slowly and carefully, Riker Fesperman spelled every word he got in the LaSalle-Marshall-Putnam Counties Regional Spelling Bee Saturday–all the way to the championship. The winning word was egalitarian. He gets $200 from the Ottawa Kiwanis Club and a spot in the grand finals in Peoria on March 22. Fesperman is a Waltham School eighth grader, and his first place performance follows his second place finish last year. 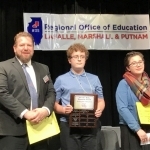 Also returning from last year’s spelling bee was Ottawa Shepherd Middle School eighth grader Corinne Francis who finished second. The spelling bee started with 31 contestants and went 18 rounds. Toward the suspenseful end, there were three consecutive rounds in which Fesperman and Francis were the only spellers left and they both spelled their words correctly. You can read our story on last year’s spelling bee at this link.